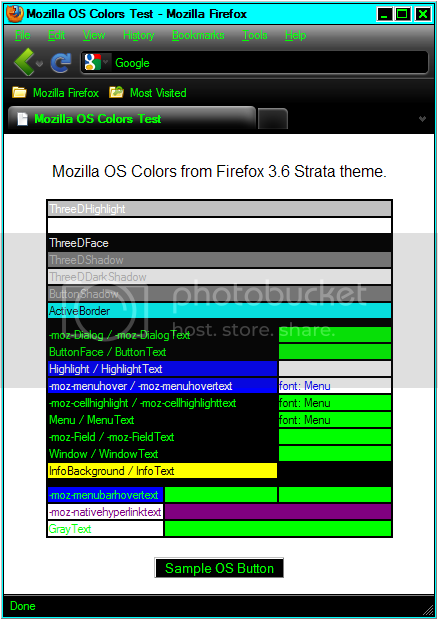 Mozilla OS Colors: Screenshots request. Ok guys, I'd love some help collecting data on what Mozilla's OS colors do in different environments. 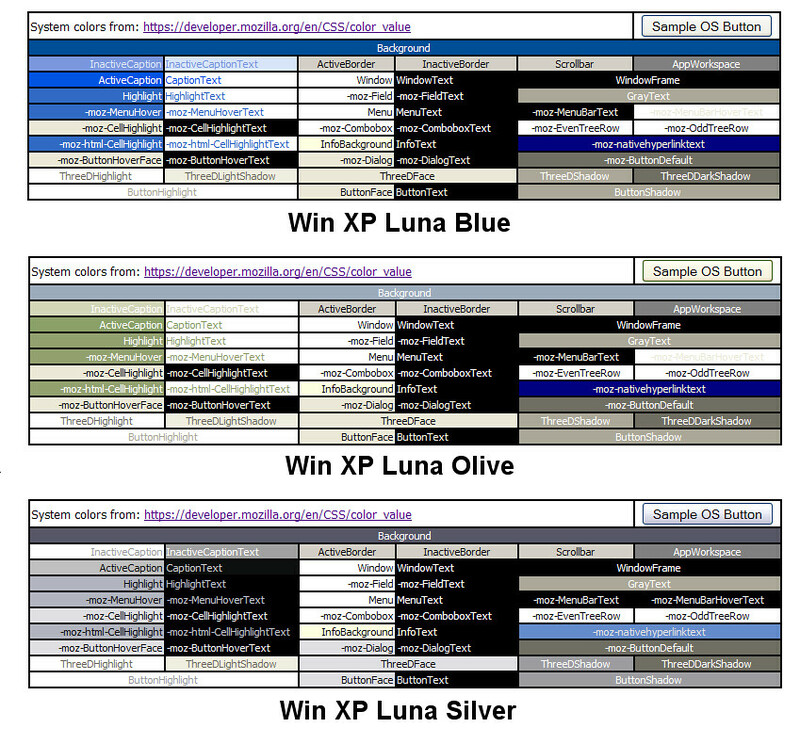 I can handle Windows XP and 2000, but I'm looking for helpful people using Windows Vista/7, Mac OSX, and Linux builds. 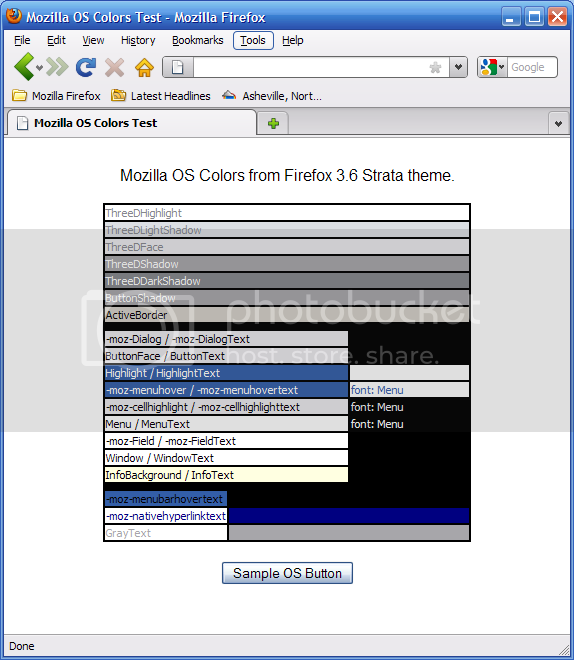 Screenshot submissions should include the specific OS, the version of Firefox (or other Gecko browser) and the OS Theme. I want to create a Flickr group that we can upload them to as a reference. 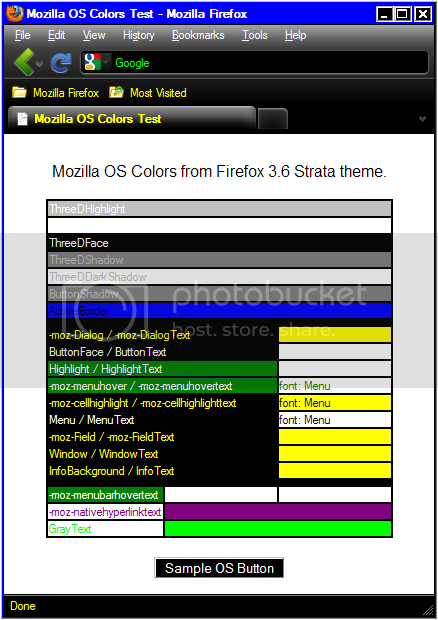 This is a really rough little html page I build that shows all of the color values I found in the 3.6 default theme for Windows as a table. 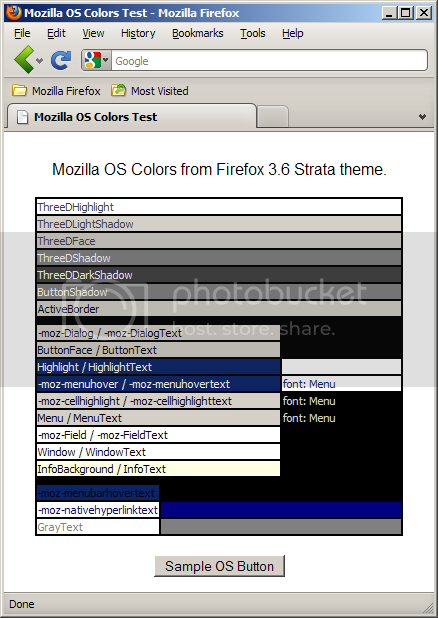 It also shows the two basic Mozilla OS fonts, "message-box" and "menu" as well as a sample button. Before we start collecting screen-shots, I'd love some feedback on the test, should I add a few more objects? 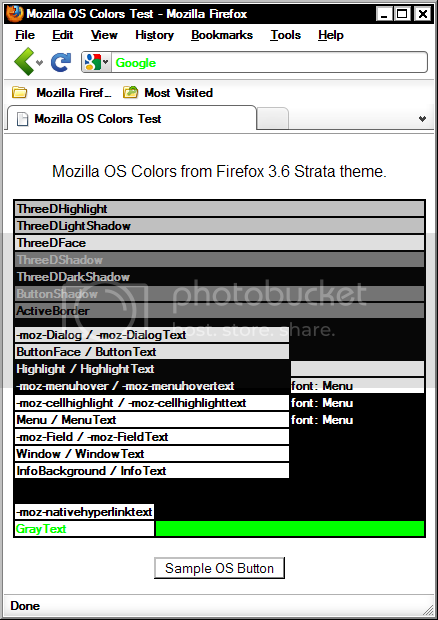 are there Linux or Mac-specific Mozilla OS colors you would like to see tested? <td style="background-color:-moz-cellhighlight; color:-moz-cellhighlighttext; font: menu;"
<td style="background-color:-moz-cellhighlighttext; color:-moz-cellhighlight; font: menu;"
EDIT March 2011: I'm updating this test again to include all of the colors I missed. I think it's organized a bit better too. Last edited by patrickjdempsey on March 8th, 2011, 4:10 am, edited 5 times in total. Is this what you wanted? Vista Home Premiun on a Dell. Mine is 3.7a3pre - do you just want 3.6? Weird colors, what OS Color Scheme are you using? Edit: I removed the reference to the Flickr group because I never got it working. Last edited by patrickjdempsey on June 12th, 2010, 7:17 pm, edited 1 time in total. Ive never used Flickr either and still probably wont. Nor MySpace or FaceBook. Here is the html file I used - I use KompoZer. Well Flickr is useless... even though it's a "public" group, you can only see the images if you are signed in? WTF? I guess I'll just migrate the images to my Photobucket account. OK, I'm finally getting back to rehosting my images and sharing them, sorry folks. Thank you tanjihay, that confirms that the "ThreeDShadow" colors should be avoided for Mac-compatible themes, as well as the purpose of the Menu font. Last edited by patrickjdempsey on January 23rd, 2014, 1:19 pm, edited 1 time in total. I didn't realize Zune was available for XP, I thought it was just for Vista and 7. 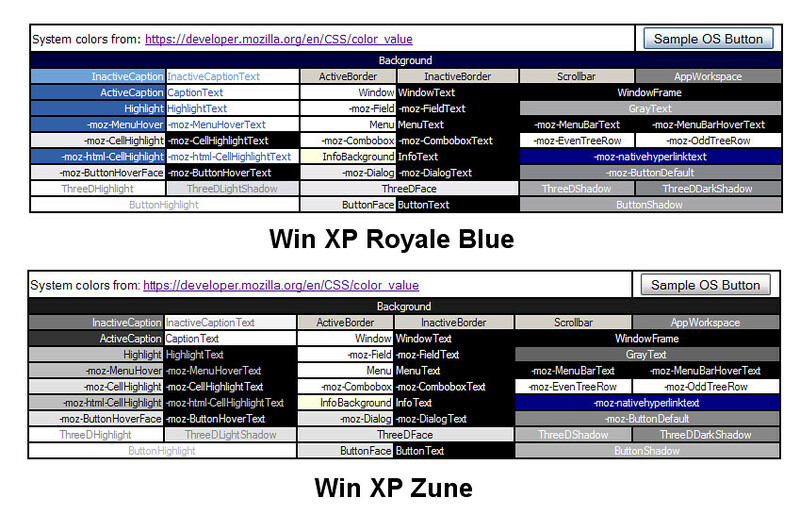 I didn't include Royale Noir because it's basically identical to Royale except for title-bars and scrollbars, but no difference in the other colors. I've added ActiveCaption and InactiveCaption to the test as these are currently being used by the test builds of 3.7. I added a new version of the test up top in the second CODE box. I'll update all of my screenshots accordingly. Newest OS color test results. I've tried to organize the sections in a way that makes sense so you can see how the colors relate to one another.